North Shore Continuum | NFI Massachusetts, Inc.
NFI’s North Shore Continuum serves 25 youth and families who live in communities throughout the North Shore. 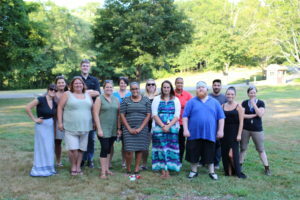 Jointly funded by the Departments of Mental Health and Children and Families, this innovative program includes an array of individualized, flexible , community-based services that are designed to maintain youth with emotional and behavioral challenges within their homes while supporting families as the primary caregivers. Services include in-home family treatment, parent support, youth mentoring, care coordination and linkage with a range of community resources. Out-of-home residential placement and foster care may be utilized for a period of time for youth who cannot be maintained safely at home. Services can easily be modified as needs change. A key feature of the continuum is a Clinical Support Team that stays connected with each youth and family regardless of where services are provided, thus ensuring continuity of approach and care throughout all levels of service. The North Shore Continuum utilizes two evidence-based programs, ARC and High Fidelity Wrap Around, to ensure the best outcomes for youth and families.